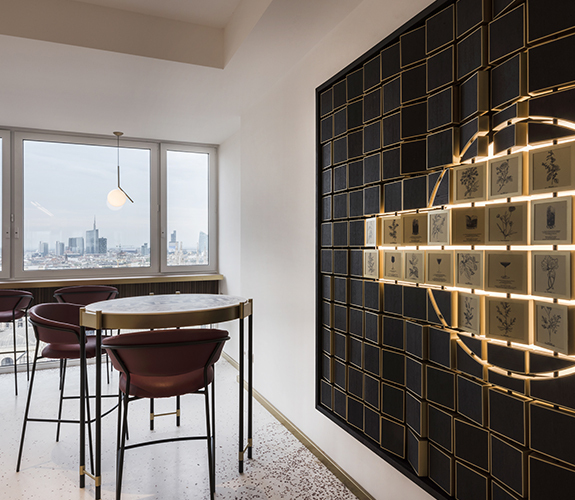 In the project entrusted to Il Prisma, every element is designed with the intent to narrate a story, exalt the vantage point over the city of Milano and celebrate that moment of the day dedicated to getting together and sharing – where the cocktail hour is central. The concept of the roof has been redefined, redesigned into a space where one can spend all day, both for business events and for the cocktail hour, until night. 1100 mq, 5 halls for events on 3 floors, an itinerary of constant surprises: the idea of the design is based on unexpected points of view that reveal the brand MARTINI and its identity. An immersive experienced is created by effects of transparency, interactive walls and optical illusions that provoke the senses and the curiosity of the visitors, like in a clue hunt. As the name suggests, THE VIEWFINDER is inspired by the tool that the director uses to find the best frame for a scene, it incorporates many points of view revealed in the space of the three new floors. The transparencies that characterise the location are a dominating element and a reference to the consistency of the cocktail: the use of mirrors and reflecting materials, that multiply the points of view by creating a reverberation of the inside light and of that of the panorama. With an eye to the past: the architectural structural interventions restore the original windows that enhance the lighting of the entire floor. The finish of the furniture reevoke the Martini ingredients from its colors to its contents. The result is a narration that unites the outdoor and the indoor without a continuous solution that amplifies the sensation of living in a unique experience. The design and architecture of the space, conceived in a style that is extremely contemporary, provide for spaces dedicated to the MARTINI heritage, like the so called “time capsule”, that takes us back to the charm of the 60s, and we are reminded of the faces of the famous people that graced the TERRACE during that time period. A space tailor-made for the guest and inspired by the warm tones of the sunset and the typical moment of the cocktail hour. Special attention is placed in the choice of the materials and the furniture, which are inspired by Milano, like the reference to the marble of the Duomo and the stones of the piazza. There is a physical itinerary that reconnects the three floors, through a perfect integration, both functional and modern, of architectural solutions and an emotional path that continues to reveal the most iconic aspects of the brand. 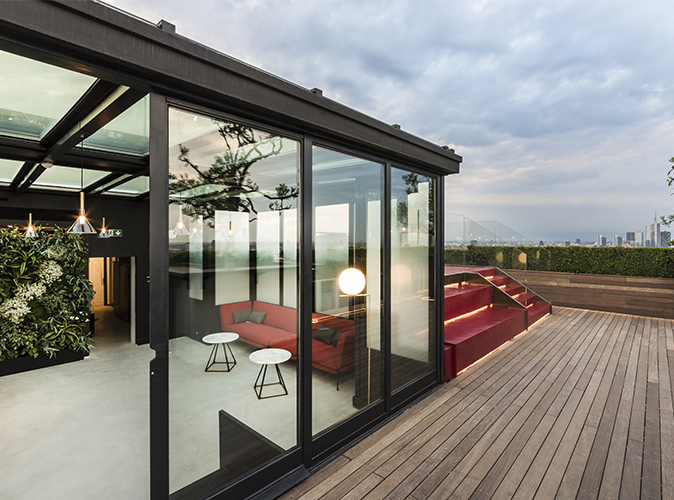 THE VIEWFINDER is the concept of the design of the new Martini Terrace Milano conceived by Il Prisma and inspired by the multiple points of view that this place represents. The restyling amplified and gave value to the three floors. The XVI floor was ambitious enough to go even higher up, to an even better vantage point, and create a panoramic bridge higher than the old gangway made in the 60s. This is where the cocktail hour takes place, the modern ritual of socialization. On the XVI floor, a botanical garden contains the essences used in the Martini cocktails with aromatic plants that the essences originate from. Melissa, peppermint, St John’s wort, are only a few of the plants present in the garden of the terrace. The same perfumes of the essences are found in the Martini bar in the Serra, its original glass structure is preserved up until this day. The unique experience of having a cocktail on the new Martini Terrace Milano is given by the idea of being in a place that made history. This is where the celebrities were, some of whom are remembered in the capsule on floor XVI. The capsule has a strong emotional value because it is built on the tip of the original stairs (now repositioned a little further away) that the celebrities in the 60s walked on. Even the hues of the sunset inspired the choices of the materials that furnish the interiors. You go from warm sunset tones to the cold tones of the marbles and stones that reference the Duomo of Milano and its piazza. Not only that. While you go through the spaces of the Martini Terrace, you are constantly surprised. 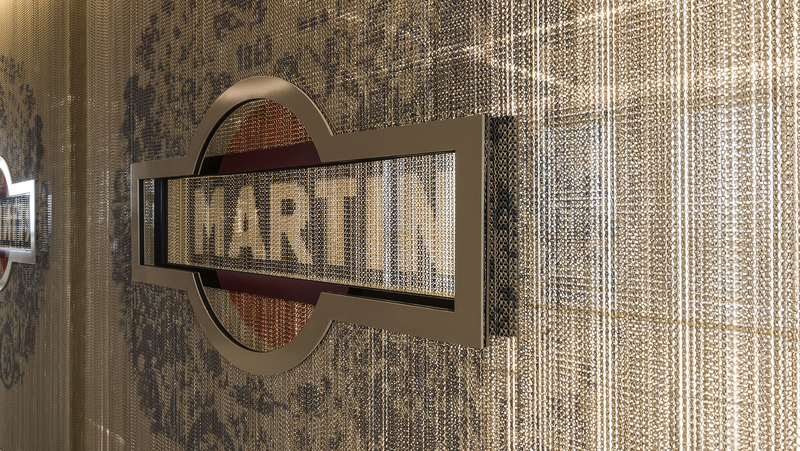 The idea of the design is based on unexpected points of view that reveal the brand MARTINI and its identity. Levels, parallelisms, surprising settings: the whole lounge area of floor XV is meant to change to meet specific demands. The metallic curtain is one of the elements that allows us to reconfigure the space. Made of three layers, each one contains a part of the Martini logo. The brand in its entirety emerges when the emerging levels are perfectly superimposed. 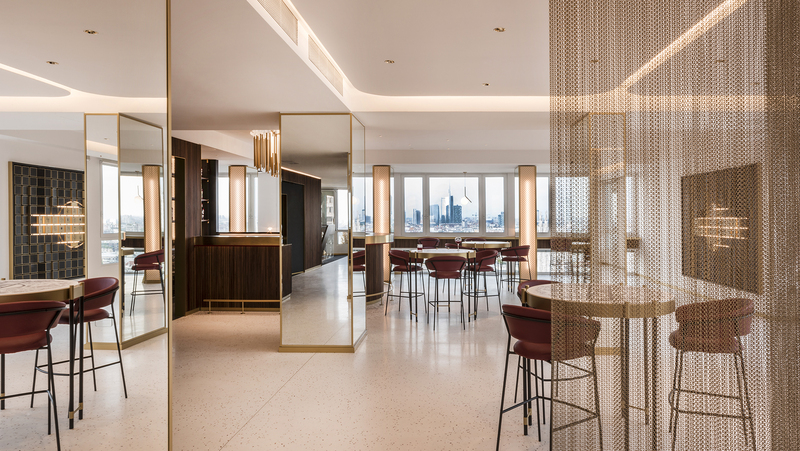 A unique chandelier stands out from the central bar on floor XV; Its manufacture in brass stems and led lights generate multiple levels where the anamorph hides, and it reveals the Martini logo only from a single specific point of view. What we have here is a unique piece, reproduced exclusively for Martini and for its Milanese Terrace. 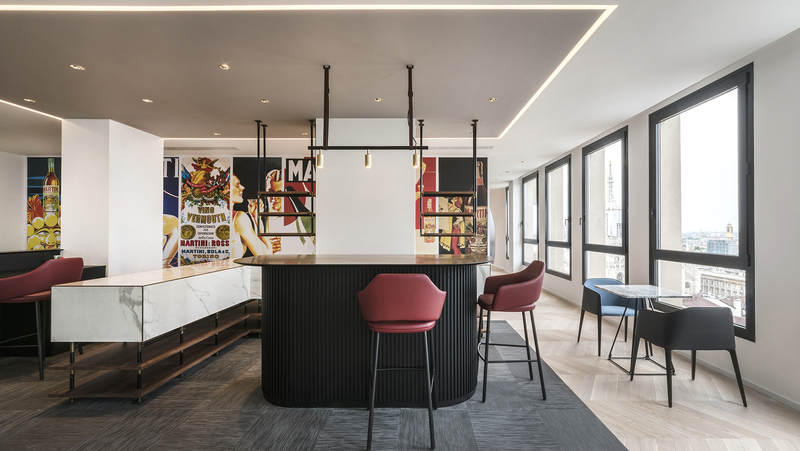 The iconicity of this detail invades the space and becomes an element of continuity together with the bar that reflects the same shape on its surface. Unlike in the past, today the bar emerges like a stage. 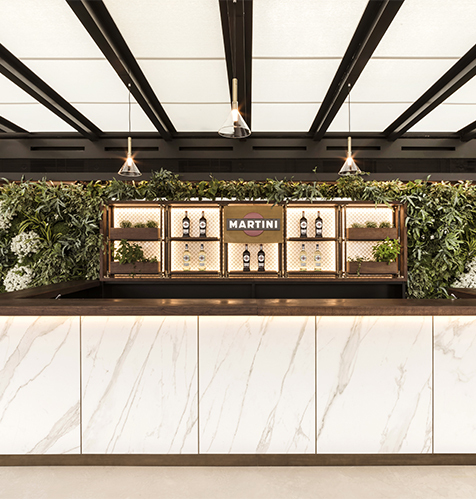 Rhubarb, scabiosa, coriander, gentian are only an anticipation of the long list of the most sought-after botanicals that make up the known Martini ingredients, like rotating pieces of a puzzle, on the DIscovery Wall on floor XV. The mobile parts make up the shape of the Martini logo, and every piece contains stylized drawings either of the officinal plant or of the recipes for cocktails. The Discovery Wall is flexible in design and modular in its application; every piece of the Martini logo can be personalized for the occasion and recreated in infinite compositions only to be revealed during special events. Many design elements reference the years when the Terrace hosted celebrities of cinema, literature, art, dance and music. Ever since the beginning of the restyling project, Il Prisma respected the conservative point of view of the superintendence and of its heritage. As a result, even the new materials chosen for the interiors accurately recall those of the original project designed by the architect Tomaso Buzzi, in 1958. Amongst all, the marble of France that upholsters the floors of the Terrace, is revoked in the seminated floor. An antique tradition flooring that today is a unique piece laid down with a traditional technique. Every detail is mixed and reinterpreted by Il Prisma with a contemporary vision. Even the iconic illustrations created for the old Martini posters were placed at the entrance of every floor of the terrace, reread by the Italian illustrator Alessandro Giorgini: the story of the brand on floor XIV, the glory of the 50s at floor XV and the ritual of the cocktail on floor XVI. Time and spaces indicated for work are fluid, without barriers, and the design of the work spaces, unless you are working from home thanks to smart-working, increasingly distances itself from the traditional work settings. The new Martini Terrace dedicates the Martini Racing floor to its business population. It is made to welcome corporate clients and whoever is looking for a space that is both exclusive and flexible from which to work from, organize events and meetings. A place that reflects the commitment of Martini from to Formula 1 since 1968.